This lemon and raspberry éclairs recipe is Mary's interpretation of the signature challenge in the Pastries episode of Season 1 of The Great British Baking Show. It is explained in further detail by Mary in Season 1 Masterclass: Part 4. Preheat the oven to 400F. Grease two large baking sheets with butter. For the choux pastry, put the butter and 150ml water in a small pan over a low heat. Bring slowly to the boil, tip in the flour, then remove from the heat. Stir vigorously. Remove the pan from the heat again, leave the mixture to cool slightly, then gradually add the eggs, beating really well between each addition until the mixture is smooth and glossy. Spoon the mixture into a large piping bag fitted with a 1/2in plain nozzle. Sprinkle the baking sheets with water (a water spray with a fine nozzle is good for this). 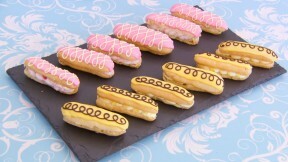 Pipe the mixture onto the baking sheets into 3in lengths, leaving room between each éclair for them to spread a bit. Bake for 10 minutes, then reduce the heat to 375F and bake for a further 20 minutes. Split each éclair in half lengthways and transfer to a wire rack to cook completely. Once the éclairs have cooled, whip the cream to soft peaks. Spoon half of the cream into a separate bowl. Fold the lemon curd into one bowl of cream and the freeze dried raspberry powder into the other bowl of cream. Spoon the lemon cream into a piping bag fitted with a 1/2in plain nozzle and pipe the lemon cream into the bottom half of 6 of the eclairs, then spoon the raspberry cream into the piping bag and pipe into the bottom half of the remaining 6 eclairs. For the icing, place half the icing sugar in a bowl and mix with enough lemon juice to form a very stiff icing. Color with the yellow food coloring and spoon into a disposable piping bag. Tip the remaining icing sugar into a bowl and add enough water to make a very stiff icing. Colour with the pink food coloring and spoon into a disposable piping bag. Snip the ends off the piping bags and pipe the top half of 6 of the eclairs with the thick pink icing. Spread over the top of the choux using a palette knife dipped in boiling water, so the top is smooth. Place on top of the raspberry cream filled eclairs. Repeat with the remaining yellow icing and 6 eclairs. Place on top of the lemon cream filled eclairs. To decorate, melt the white chocolate drops in a bowl set over a pan of simmering water. Drizzle over the pink eclairs in a zig zag pattern. Melt the dark chocolate drops in a bowl set over a pan of simmering water. Spoon into a small piping bag and snip the end off. Pipe swirls over the lemon icing.